MODESTO, CA USA -- ACCOUNTABLE CARE UPDATE NEWS SERVICE -- MARCH 22, 2019: The Accountable Care Directory 2019, compiled by MCOL's HealthQuest Publishers, provides 762 pages including an Organizational Directory of 731 selected ACOs, with all current Medicare ACOs plus many commercial ACOs, and listing 4,213 staff indicating direct phone and email contact information when available. Executive Profiles providing contact and biographical information for 246 ACO thoughtleaders and executives are also included, along with Indexes for convenient navigation and reference organized six different ways. 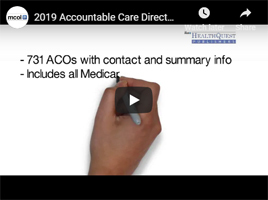 The 2019 Directory reflects deletion of 66 Medicare ACOs that ceased participation since the last update; lists 703 new ACO staff and deletes 538 terminating ACO staff; plus 59 ACO mailing address changes, and other updates. Leverage MCOL's HealthQuest Publishers' Accountable Care Directory 2019 to help fulfill your business objectives in the Accountable Care environment in 2019and beyond! Find it Online: https://www.managedcarestore.com/yhlthqst/hqaco.htm or Call: (209) 577-4888.